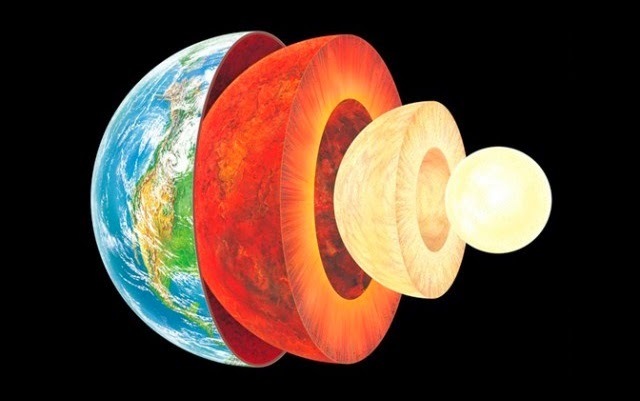 After decades of theorizing and searching, scientists are reporting that they’ve finally found a massive reservoir of water in the Earth’s mantle a reservoir so vast that could fill the Earth’s oceans three times over. This discovery suggests that Earth’s surface water actually came from within, as part of a “whole-Earth water cycle,” rather than the prevailing theory of icy comets striking Earth billions of years ago. As always, the more we understand about how the Earth formed, and how its multitude of interior layers continue to function, the more accurately we can predict the future. Weather, sea levels, climate change these are all closely linked to the tectonic activity that endlessly churns away beneath our feet. This new study, authored by a range of geophysicists and scientists from across the US, leverages data from the USArray an array of hundreds of seismographs located throughout the US that are constantly listening to movements in the Earth’s mantle and core. After listening for a few years, and carrying out lots of complex calculations, the researchers believe that they’ve found a huge reserve of water that’s located in the transition zone between the upper and lower mantle a region that occupies between 400 and 660 kilometers (250-410 miles) below our feet. As you can imagine, things are a little complex that far down. We’re not talking about some kind of water reserve that can be reached in the same way as an oil well. The deepest a human borehole has ever gone is just 12km about half way through the Earth’s crust and we had to stop because geothermal energy was melting the drill bit. 660 kilometers is a long, long way down, and weird stuff happens down there. 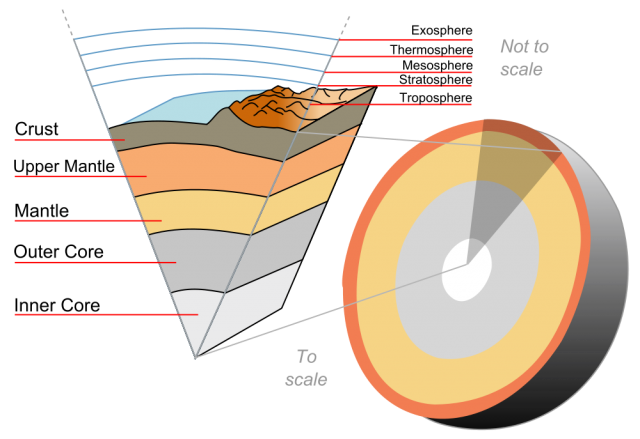 Basically, the new theory is that the Earth’s mantle is full of a mineral called ringwoodite. We know from experiments here on the surface that, under extreme pressure, ringwoodite can trap water. 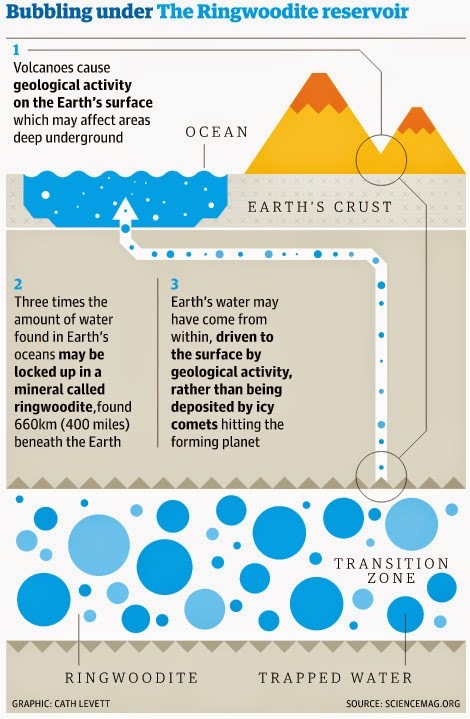 Measurements made by the USArray indicate that as convection pushes ringwoodite deeper into the mantle, the increase in pressure forces the trapped water out (a process known as dehydration melting). That seems to be the extent of the study’s findings. Now they need to try and link together deep-Earth geology with what actually happens on the surface. The Earth is an immensely complex machine that generally moves at a very, very slow pace. It takes years of measurements to get anything even approaching useful data. Finally, here’s a fun thought that should remind us that Earth’s perfect composition and climate is, if you look very closely, rather miraculous. One of the researchers, talking to New Scientist, said that if the water wasn’t stored underground, “it would be on the surface of the Earth, and mountaintops would be the only land poking out.” Maybe if the formation of Earth had be a little different, or if we were marginally closer to the Sun, or if a random asteroid didn’t land here billions of years ago, you probably wouldn’t be sitting here surfing the web. DOI: 10.1126/science.1253358 - "Dehydration melting at the top of the lower mantle"